SI's elegant Reference Series projector screens set the standard for high-end fixed screens. The reference series offers SI's renowned HD screen materials in an elegant fixed frame that's easy to install and brings your projected images to life like never before. Reference fixed frame screen texture finish is satin-smooth, ensuring your screen won't detract from the clarity of the projected image. This screen looks great even when you're not watching anything! If you are looking for the ultimate room decor add any of SI's Screen Accents options can be added to the luxurious 3.5" beveled frame. SI's revolutionary EZ Snap™ screen material attachment method ensures the flattest, tightest screen material on the market today. This system optimizes projector focus, producing sharper images, as well as permanently eliminates any concerns about traditional screen sag. 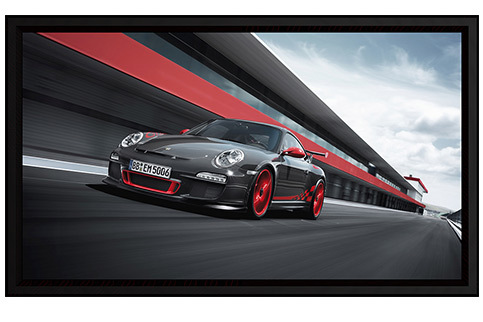 Gamma Maestro 4K is a woven screen material with black level and color saturation enhancement combined with excellent color neutrality, 4K resolution, brightness uniformity, and wide viewing angles combine to make it an excellent screen for use with a bright projector in both moderately lit and dark environments. Gamma Maestro’s acoustic characteristics provide industry leading audio clarity with a maximum measured variance of +2 -1 db from 20 to 20k Hz. Gamma Maestro 4K front projection screen material is intended for use in dim to moderately lit environments with bright projectors. It is still helpful to keep room lighting focused away from the screen as this material does not absorb ambient light. Warranty and Lifetime Replacement Program: Screen Innovations has a one-year warranty from manufacturing defect. Screen Innovations also offers a 30-day return policy for non-damaged, unopened products. If returned unopened, there is a 25% restocking fee. Otherwise, there is a 50% restocking fee. No returns are allowed after 30 days. However, should your screen later require repair or replacement, Screen Innovations offers a lifetime replacement policy with a replacement screen at 50% off of retail price. This discount is not applicable for product upgrades. We have no downloads available for the Screen Innovations 5 Series Fixed at this time. In stock, please allow 1.5 - 2 weeks for delivery.